Those were different times, different in many ways. The context and the setting in the late sixties and the first half of the seventies were markedly distinct, and individual personalities played such a crucial role that their imprint on the history of the 'movement' can never be blotted out. George was one such personality. He was influenced, like many others, by the events and happenings of those times, from peasant resurgence in parts of the country, unrest in Telangana, and the unemployment problem, to the 1968 student revolt in France, the Vietnam War, and of course, Che the revolutionary. In Satyajit Ray's film “Pratitbandi”, the protagonist - an educated unemployed youth - goes for an interview. The interviewers ask what he thinks is the significant event of the decade. He answers: 'The Vietnam War'. The interviewers ask if he is a Commie, and the protagonist gets up angrily and walks out. That is the true picture of those times. George grew up in this milieu, and become an extraordinary personality who made his own mark on the movement, and shaped its growth in those times. It is almost forty years since we lost him. This is my tribute to a man who made an indelible impression on me and changed the course of my life. 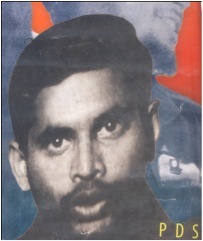 On the 14th of April 1972, some time in the evening, I was at a rendezvous near YMCA with a friend when Gopal came rushing to inform us that George was no more, killed in one of the University hostels by hired goons from Dhoolpet. I dismissed the news, and told Gopal it could never be so. Still the three of us went in Gopal’s car to Srinath’s place in Himayathnagar. We ran up the stairs to Srinath’s room. Srinath stared at us and showed us the pamphlet he had just finished writing. It was unbelievable, for how could George our hero die, who had said more than once that death would not come for him so early. It was a shocking reality that death took him at the age of 25. His body had been shifted to the Osmania Hospital mortuary. When we reached, there was already a mass of students from the campus flanked by a fairly large police force. The mood was tense. One student snatched the name plate from the chest of an ACP, and another sent a police officer’s cap flying. The anger stemmed from the fact that the police and the Osmania University administration had been informed much earlier that outsiders were roaming freely on campus, and had taken no measures to stop the killing. On 15th April, the next day, some two thousand mourners had gathered near George’s residence at DD colony. It was total silence in a surcharged atmosphere when his body was brought out in a coffin. All of a sudden, the arrested emotions inside everyone found vent in the slogan ‘George Reddy Amar Hai’. We marched in procession to Narayanaguda cemetery surrounded by a huge police force. Kesava Nilayam (RSS HQ) was on the way, When we reached it, emotion took over, and some student comrades ran up the walls. Some police officers took out their revolvers. Anything could have happened at this point, had we not shown restraint. George was buried, and thereafter some of us walked from the cemetery to Cosmopolitan Café. We discussed for quite some time how the incident might have happened. Nobody knew what was to be done, but all minds were set on one and only one thing - avenging the dastardly killing. George was killed on a Friday, the day our study circle (Ramani, Aswin, Gopal, Mazhar and a few others) was to meet at our Barkatpura residence. We had been studying Lenin’s ‘Imperialism, the Highest Stage of Capitalism'. The previous Friday, George had explained and made us understand the evolution and working of monopoly capitalism. Just a day before he died, George had told us the study circle would not meet that week, and we would not finish our study of Lenin, because of elections in the Engineering College. In the late sixties i.e. 1968-70, I had heard of George as a dada with a gang of his own. In 1970-71 I saw him at a couple of meetings organized by the Marxist Educational Society, at the YMCA, where Mohit Sen was often a speaker. I used to see George in the audience, asking questions and speaking boldly. It never occurred to me that the dada I had heard of, and the intellectual posing questions and speaking out at those meetings, were one and the same person. Let me recall my first meeting with George as George. I joined the University Science College as a degree student in 1971. Aswin was one of my college-mates. I met George for the first time in June '71 in the small canteen next to the Astronomy Department. The canteen was an adda for many because George was a habitue. One day in June '71, Ashwin and I were in the canteen, making small talk. Aswin wrote something on a piece of paper, and pointing to a person at a corner table, engrossed in discussion with those around, asked me to get his signature on the paper. I was only too eager to do so, when told that George was the person at the corner table. I went up and wished him. He looked at me, obviously wondering why I was there holding out a piece of paper. I introduced myself and referred to my brother (he and George were classmates in B.Sc.). Then George was able to place me. That then was my first formal meeting with George. After a few months of regular interaction, he became my ‘revolutionary hero’. Some memories are still fresh. After class got over in Science College, some of us would deliberately hang around the Arts College bus stop from 3.30 to 4.00 p.m. because that was when George would be walking down from the Osmania Library to the adda. Informal debates took place at the adda on a wide variety of subjects - sciences, materialist philosophy, revolution, poverty in India, et al - with a variegated cross-section of students eager to hear what George had to say. Hanging around the bus stop, seeing him walk down the slope from the Library in jeans and olive green shirt, always brought Che to mind, though George bore no physical resemblance to the Latin American revolutionary icon. That Che greatly influenced George’s thinking is beyond doubt. Through George, some of us learnt by rote Che's famous lines in Venceremos, which started “whenever death may surprise us…..”. I believe this was a period when George, apart from the frequent physical clashes with the likes of Surdas Reddy, Narsimha Reddy, and others of the RSS persuasion, began to organize study circles. The label was Socialist Youth Forum, a branch of the CFSA (Congress Forum for Socialist Action), but George brought out leaflets on issues like communalism and the Vietnam War under the label of Progressive Democratic Students. It is this PDS that later became the PDSU. George organized a debate on the topic “Armed Revolution in India” in Science College. Anirudha and a few others participated. George, in his concluding remarks, dealt with the colonial mindset that plagues a nation even after colonial rule ends. That such a debate on such a topic could be organized in those times reflects the political atmosphere in the wake of the Naxalbari and Srikakulam Peasant Uprisings. During this period a couple associated with the May 1968 French Student Revolt came to Hyderabad. I knew them and George was interested when I offered to set up a meet. George met them several times before they left Hyderabad in February 1972. The discussions were on the strategy and tactics of the Indian Revolution. Around the same time, and on the same subject, George had several meetings with RR/NR, leader of the then APRCP (AP Revolutionary Communist Party, aka the CP Group). George was a fighter and did not hesitate to risk his life. His academic brilliance, his intellectual capacity, and above all, his strong Marxist ideological moorings and revolutionary thinking, were what made us gravitate to George. He became our repository of everything revolutionary. He shaped my thinking and made me what I am today. A filmmaker based in Poona/Bombay made a documentary titled “Crisis on the Campus”. It had George, Kulkarni, and Ajay Sinha, among others, discussing student unrest. George's interview is a little longer than the others'. He talks about student unrest and violence. If memory serves, he talks of how dissenting voices go unheard in the system, and peaceful protests are crushed by violence: not unlike Frantz Fanon’s notions. In 1973-74, PDSU organized screenings of “Crisis on the Campus” in OU Tagore Auditorium and Sangeet Theatre in Secunderabad, along with Pratidbandi, Satyajit Ray's feature film on the unemployment problem. The moment George appeared on screen, bearded and in his olive green shirt, emotionally charged slogans “George Reddy Amar Rahe” and “jeena hai tho marna seekho, khadam khadam par ladna seekho” drowned out everything. The latter slogan is very popular with militant organizations, who make it a regular in their programmes. I do not know who coined the slogan but somehow it is attributed to George. I salute George. I salute Jampala and Madhu, who laid down their lives in the movement. The Revolt Spring Heralds in Osmania University..!!! There are blows in life, so powerful . . . I don’t know! I don't know...! May I ask if this has been translated from Urdu or any other language? If so, I would like to see the original too? Well, George associates and his immediate descendents of political thought have paid tributes to him by writing about him. As rightly mentioned by some of them, George was a product of his times. People make history but able leaders also impact the history. George definely was a good leader of courage and conviction. The sad part of it is: Yes, situation has greatly changed. State repression could succed in suppressiing the peoples movements because of many leaders, activists drifted away from the movements. This is true with George associates and friends.But why these activists did give away the scientifc world view in which George believed? Sheer oppurtunism. one can surely apply the scientific world view to day to day life problems. When one fails to use it as aguide to solve life issues, no use of shedding tears to George. One can be politically inactive if wanted but believe in the great philophy of materialism. Today i read about him in the newspaper. It was very inspiring to learn that at a very tender age how he gathered great ideologies and stood for justice. He was an epitome of a perfect student, who was brilliant in studies, and also created time to work for social cause. He is a Real Hero and must not be forgotten. If at all he wuld have lived today...Ah! what a man! can any one tell real truth.. i heard diff stories.. but who killed him?? Stumagz is ultimate platform to release student magazine articles and engineering college news. It helps students to share their ideas in form of article.